The city of Szczecin is located in Poland and is the capital of the West Pomeranian Voivodeship. The population is around 406 000 people. Szczecin is situated on the river Oder, along the southwestern shore of Lake Dąbie. The town's history begins around the 8th century when a Slavic Pomeranian fortress was built. Then the area was inhabited by Slavic tribes. In the twelfth century a settlement appears around the castle and it became a major urban center - Pomerania. Local rulers were of the Dynasty Griffin. The population adopted the Christian faith and from Western Europe began arriving new settlers. The local Slavic population gradually decreases in the following centuries. After the thirteenth century the dynasty of the Griffins again raises a castle in the city and it became one of the main residences of Pomerania. After the Treaty of Szczecin in 1630 it falls under Swedish control, although its population is composed mostly of Germans. Until 1720 it remained a Swedish fortress, and then is acquired by the Prussian Kingdom and became the capital of the province of Pomerania, which after 1870 was part of the German Empire. After the ninth century, the town fortifications acquire defense and expand to the River Oder. In 960 the Polish ruler Mieszko I took control of Pomerania and Szczecin joined Poland. The city became one of the most important ports in the Baltic sea. In 1121 Bolesław III, Count of Poland, won control over the region. At that time, was built the first Christian church in town - the church of the apostles Peter and Paul. At that time, in the city lived about ten thousand people. After the death of Boleslaw III, Anselm of Havelberg and Konrad of Meißen besieged the city. They are joined by a Mieszko the Third. To avoid forcible conversion to Christianity, the townspeople erected crosses to show that they have already adopted Christianity as their religion. In the thirteenth century the city's economy prospered due to trade in the Baltic Sea. In the city reign anti- Slavic moods and people of Slavic origin were forbidden to join craft guilds, Slavic customs tax is doubled and traders were forbidden to speak in public places in their native language. Richer Slavs were forcibly deprived of their wealth. The statutes of some guilds have points, which stated that the guild is fighting for the Slavs to be expelled. At this time, they start burning witches, which are limited to only four stakes. In 1570 Congress was held in Szczecin, which ended the Northern Seven Years' War. After the Treaty of 1630 the city was occupied by the Swedish Empire. The city had become an important Swedish fortress was besieged several times during various wars. These wars ruined the economy of the city. During the Great Northern War, the city's population dropped by two thousand people from an epidemic of plague. By 1873 the city remains a defensive fortress. Szczecin became an important port and became a Prussian industrial city, its population grew to over 255, 000 in 1925. Before World War I the Poles in the city numbered about three thousand people. During World War II, Szczecin was the basis for the German motorized division. After the war the city had brought many workers of Slavic origin. Over a hundred camps for forced labor for Slavs were founded. In 1945 the majority of the German population of the city left it. After the war the city became part of Poland. The city is rebuilt and its borders expanded. In 1962 during a military parade a tank crashed into the crowd and killed seven children. 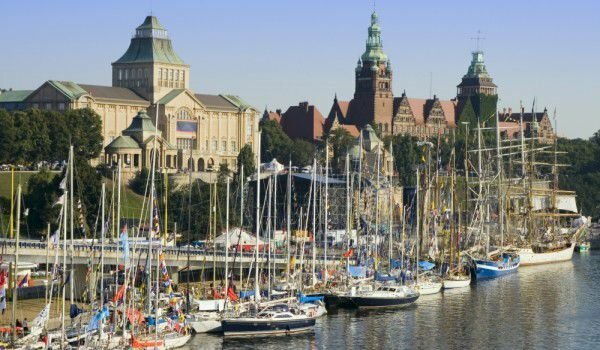 Today Szczecin is a city whose economy focuses on tourism, and attracts many lovers of beautiful scenery from around the world. Among the main attractions of the city of Szczecin is the castle of the Pomeranian counts. It was built in 1346 and is one of the most impressive places in the city that tourists never miss to visit. The castle is actually the city's cultural center. The castle is home of the city opera house and art gallery, where impressive works of art are collected. Eagle Fountain is another landmark. It was made in 1732. An interesting fact is that on the central street, where tourists go, is a red line on the pavement that literally takes tourists to the city's attractions. Among the parks in the city stands Kasprowicza, who offers walks for families with children. It has beautiful gardens and paths. It has a summer theater where plays are put on, and a beautiful lake that attracts couples.